I can easily say that the NUMBER ONE thing that I get asked about making are EASY, WHOLESOME snacks that the entire family will enjoy. My knee jerk reaction tends to lean towards fresh fruits and veggies with wholesome dips like hummus or nut butters. But someone, somewhere wants something even easier that they can grab on the go, taste great, and requires no cutting or dipping. 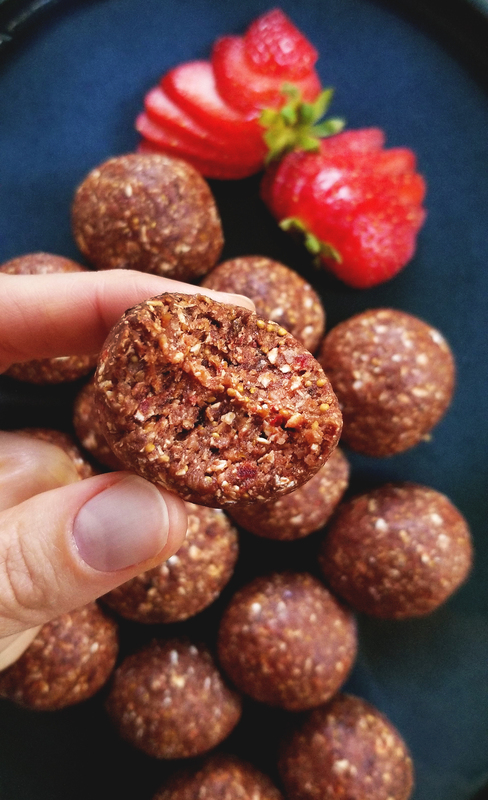 Energy balls/bites are always a great option for nutrient dense snacks that are delicious, portable, and easy to make. 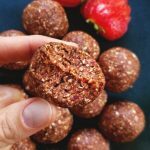 One of my first snack ball recipes were my Gluten-free Gingerbread Bites which are a healthy guilt free version of your favorite holiday cookie. 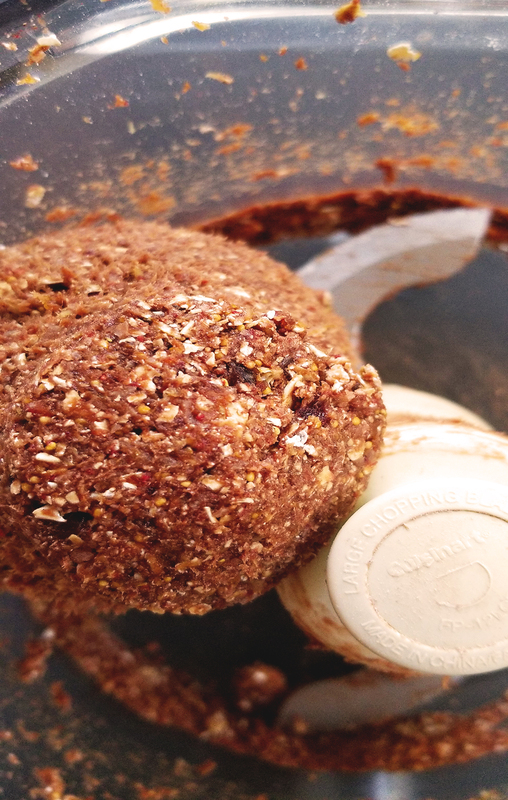 This time I wanted to make a more universal snack ball flavor which can be enjoyed year round. 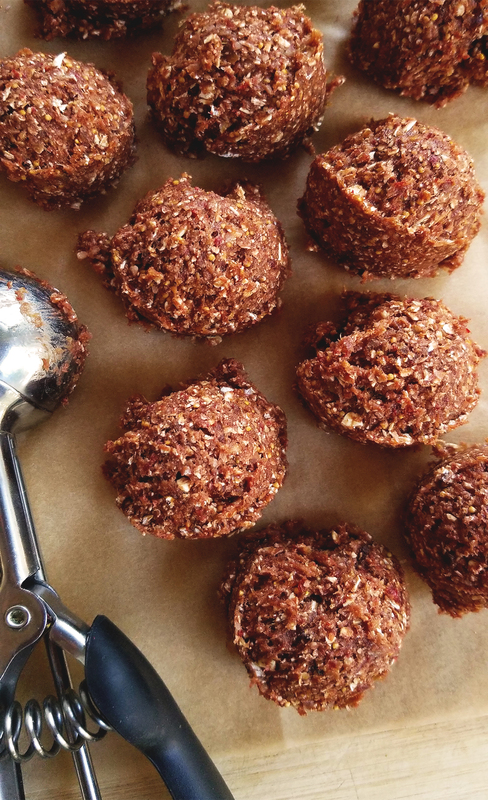 The base for this recipe revolves around dates, unsweetened coconut flakes, and rolled oats. This combination gives you a great foundation of sweetness, healthy fats, and whole grains which from here you really can flavor it however you please. My inspiration for this particular flavor came from two of my favorite snacks growing up, fig newtons and strawberry pop tarts. Using soaked dried figs, and freeze dried strawberries, you get a bright berry flavor with that iconic crunch of the fig seeds. 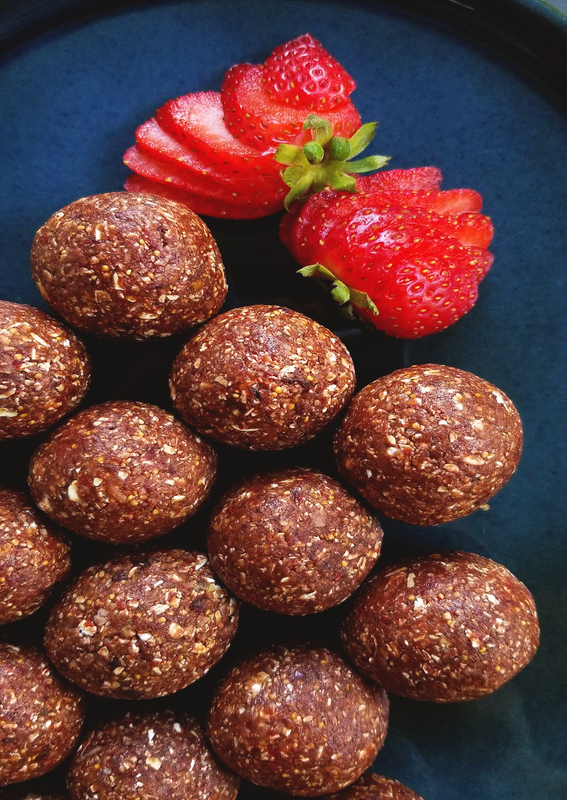 To really pack in the nutrition I added in a scoop of cacao powder to round out the flavor of these little snacks. These bites are easy to make, and can be stored in the fridge ready for snacking whenever you are. Enjoy! 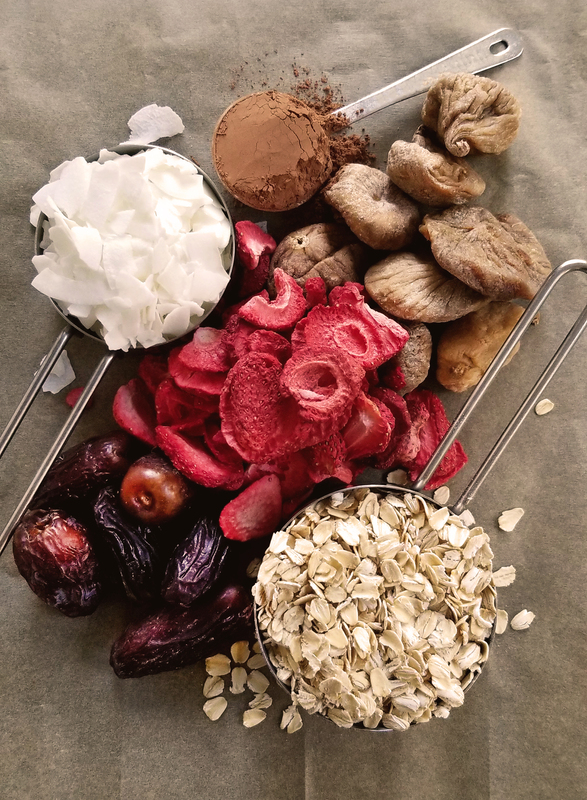 Inspired by two of my favorite childhood snacks, Fig Newtons & Strawberry Pop-Tarts, these sweet and chewy snacks are loaded with nutrition and taste delicious. With just 6 ingredients they are simple and perfect for a quick bite on the go! 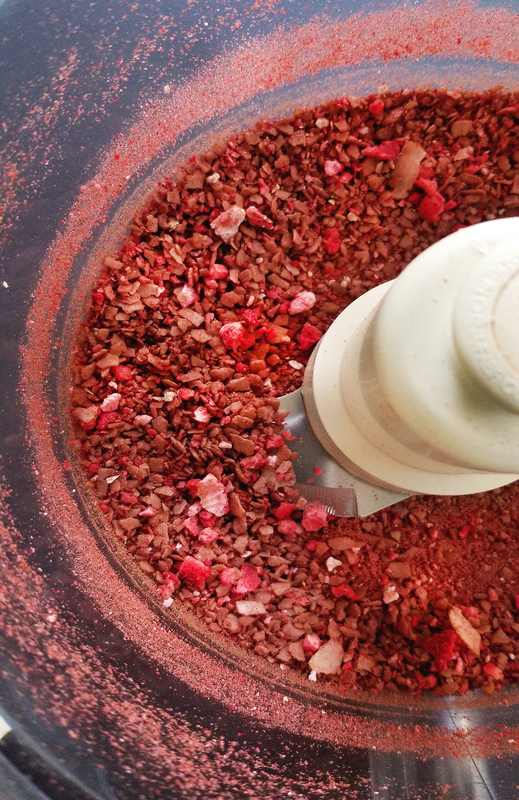 In a food processor, add the freeze-dried strawberries, coconut, and cacao powder and blend until combined and powder-like. Add in the hydrated figs, dates, and 1 c. of the oats. Pulse until the mixture starts to become sticky and combined. Once it is mostly combined add in the remaining 1/3 c. oats and give it a few more pulses until a ball forms. Using a heaping tablespoon or a baking scoop, scoop out equal portions of the mixture onto some parchment paper. Once the entire mixture is portioned lightly dampen your hands and roll each ball in between your palms to form smooth balls. Place into a storage container and freeze or refrigerate until you are ready to snack! Depending on the size of the scoop you can get anywhere from 15-22 balls. So it's up to you how big or small you want them.